This is an ongoing series of posts where I share my learning progress and resources while developing my first 2D Platformer with UE4 and Paper2D. Feel free to help me out if you know some tips & tricks. If you follow along, I would be happy to see your progress – get connected! If you don’t have Unreal Engine 4.8+ installed yet, get it! This release gives us a lot of new features and improvements inside the Paper2D plugin. 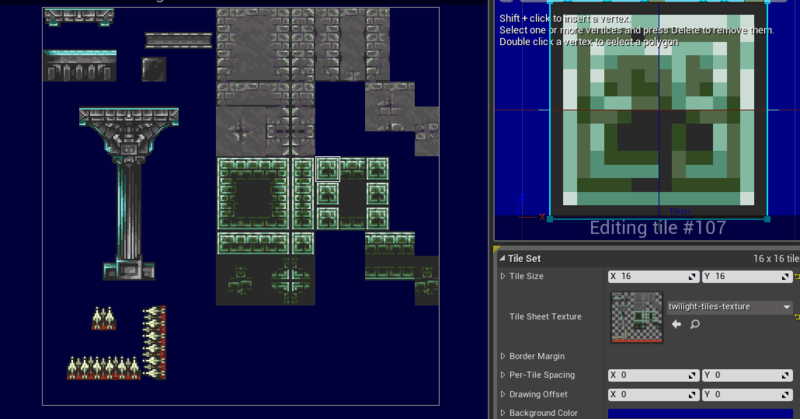 Most important: Tileset and Tilemap Editor with Collisions. Start a new blank project with no starter content. 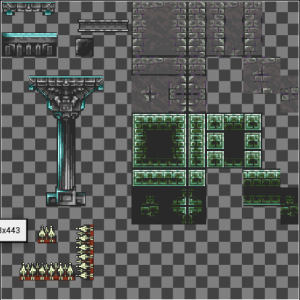 If you like to know more about creating your own tileset, have a look at this (long) tutorial from Orianart. Inside the Tileset Editor you define the tile-size and collisions for this texture. You need to know the size of each tile (e.g. 16x16px, 32x32px etc.). Select each tile which should get a collision border. In most cases you can use the boxed collider and fill the whole tile. But you can also create individual colliders with the polygon tool. Snap to pixel is helpful, as the editor has a much higher resolution than your pixel art. Create all assets for your backgrounds and platforms this way, as we are going to use the tilemap editor in the next step to build our level. With a configured Tileset we can start blocking out our first level *exited*. Create a new Tilemap and start “painting” whatever you like. If you have no ideas yet, don’t worry. Just place some platforms, pits and other placeholders, so a character can run around later on. On the left side you choose the tileset you wish to use. On the right side (not shown on this picture) you set up the important parameters for these tiles. As material I just use the unlit masked sprite material from the Paper2D Plugin content, as we are not using a light-setup (yet) and a Pixel per Unit value of 0.32. On the top-right you have the layer-setup. Use these layers to position your tiles and build background, middle- and foreground (platform) elements. If you paint the background, you can deactivate collisions for this layer completely. For more infos how to use the Tilemap Editor, watch the following video by DokipenTechTutorials. It helped me a lot to get a quick intro. But keep in mind that is was created for the experimental features of the UE4.7 version, which didn’t include collisions yet. The next post will be about creating our player character and how to start running around! Thank you. This was a massive help in assisting me with my first bit of game development.